I know that soccer can engage and enrage the senses. And doubtless there have been other occasions when sports fans have killed and been killed in the frenzy of a game … or after. In Boston seven years ago, after a Red Sox win over the Yankees that clinched the American League pennant and was being celebrated in the streets, a 21-year old college student was killed and 16 others were wounded by police trying to control the crowds. It is true, to be sure, that soccer has much more volatile fans around the world than baseball: In November 2009, a fracas broke out between fans of the Egyptian and Algerian teams playing in the World Cup playoffs, a bloody fracas. Cairo broke diplomatic relations with Algiers for failing to protect its fans from the venom of Algeria’s. Yes, and vice versa. And, in his elevated positions as “leader of the revolution and chairman of the African Union,” Colonel Qaddafi was called upon by Arab League Secretary-General Amr Moussa to mediate the dispute. Moussa is today a candidate for the Egyptian presidency. Hosni Mubarak, the now ex-president, had thundered that he would not permit his citizens abroad to be humiliated. This is a long and ongoing comedy. OK, tragicomedy. The latest battle of the soccer fans occurred between the male phalanxes and fans of two Egyptian teams, the locals being from Port Said and the visitors coming from the country’s capital. The Cairo team is named Al Ahly. But its fans call themselves “Ultras.” A rivalry has long stewed between the two, and this is not the first violence to hit them. At least 74 people were dead at the end of the first confrontation, around 1,000 injured. Then came the postmortems with more bloodshed and also corpses ready for burial. The police were accused of favoring the Port Saidians. But the Ultras did the accusing. General Tantawi is the scapegoat of the slaughter, and there are now demands that he be sent to the gallows. President Obama has been quiet about these happenings. Alas, there is nothing for him to say about them. Some critics pretend that he could have rescued Mubarak from his humiliating prison gurney. And then what? Perhaps the president will take the time of his silence to reflect about how wrong he was in his estimate of Egypt, so tragically wrong that it approached the absurd and the sordid. Obama can’t get off the hook quite so easily with his record on Syria, towards which he was for almost two years so dreadfully wrong and wrong-headed. He had no particular policy towards Egypt. But he did have a policy towards Bashar Assad whom he courted relentlessly, with the enthusiasm of his secretary of state (and a few of her yes, oh, so clever Jewish underlings who thought they would bring salvation to Damascus by computers and computer games), until the energy and enthusiasm expended on the dictator became a joke. The president’s ambassador, Robert Ford, on the other hand, acted bravely on the ground in identifying the American people with the hapless Syrian population. At last, Obama, too, has spoken up in what Anita Snow of the Associated Press characterized as a “blistering statement,” condemning Assad for his “disdain for human life and dignity. … The Syrian regime’s policy of maintaining power by terrorizing its people only indicates its inherent weakness and inevitable collapse. … Assad has no right to lead Syria, and has lost legitimacy with his people and the international community.” Blah, blah, blah. The “international community” is, of course, an abstraction, and the legitimacy it bestows is worth something only to tyrants. The Arab League, mentioned above in relationship to violence over a fight after a soccer game two years ago, had also tried to put its stamp of approbation on Assad’s relentless pummeling of his population. But its initiative fell apart when Saudi Arabia withdrew from what it correctly saw as a diplomatic charade. The issue was just now, as I write Saturday night from Tel Aviv, before the Security Council where Russia and China (not to be outdone by Moscow in its inhumanity) have vetoed the resolution calling, as Reuters put it, on Assad to step aside. And to assure everyone that this was the end of it, Clinton said there would be no troops sent by anyone. Her promise was superfluous: It was written into the text. Yet this was the day, as Reuters also noted that the dictator’s army killed 300 civilians in the Sunni city of Homs alone. Of course, nobody really knows how many people exactly are now dead in Syria. As the bloodshed continues day by day, the estimate of the total body count seems to remain static. But reasonable Arab numbers hover around 7,000 to 7,500, and these are confirmed by Israeli intelligence, which has a stake in knowing the capacity of Syrian troops to kill. This is nothing less than a bloodbath, which follows nothing more than a blood feud, but one which has gone on for centuries. 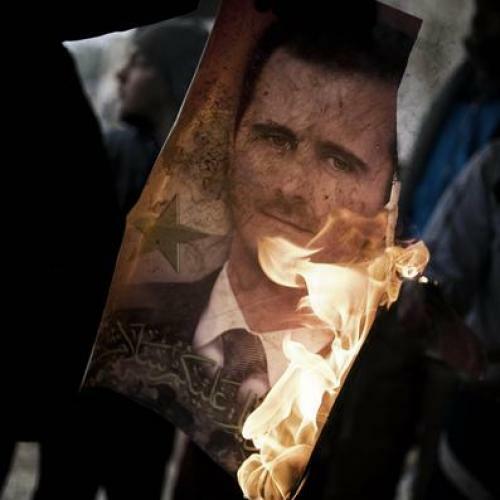 Syria—with its sectarian hatreds, its ethnic animosities, its historical pretensions, its territorial ambitions, its political conceits, its economic endearments—may presently be ruled by the Assads. But, were the Sunnis empowered in Damascus instead of the Alawite “pretenders,” nothing less cruel would define the exercise of power or the map of financial favor. They would just be different. The nation-state is not fit for a society delineated by these groupings. This is why some experts expect Syria to split apart into turf defined primarily by local allegiances, foreign neighbors, cross-border loyalties, religious inheritance and belief. This may be a bit far-fetched. But Syria has not the traits of an ongoing and functioning political union. Which is why blood has flowed there so freely. If your neighbor is not of your lot he is, if not a downright enemy, at least a stranger. This population pattern is now writ large in Syria, written in sanguinary ink. No one will be able to resurrect whatever there ever was of the Syrian nation. Maybe there will actually exist a heavy-handed Syrian government in Damascus. But there is no longer a people of Syria, God bless them all in their differences.